Whilst the Indy is of course free to publish such predictably one-sided anti-Israel screeds, they are prohibited, per the accuracy clause of the Editors’ Code, from including claims that are false or misleading. There are at least two clear examples of such distortions in the op-ed (Theresa May is showing contempt for Palestinian rights as she rolls out the red carpet for Israel’s Benjamin Netanyahu, Feb. 6th). Land seizures and demolitions affect Palestinian citizens of Israel also. Just a few weeks ago, Israeli authorities demolished homes in the Palestinian Bedouin village of Umm al-Hiran, in southern Israel, to make way for a new Jewish village. When Palestinian residents protested the bulldozers pummeling through their homes, a local teacher was shot dead by Israeli police, who then branded him a terrorist. The cycle is clear. Palestinians’ homes and livelihoods are destroyed to make way for settlements. When Palestinians protest, they are met with violence at the hands of the state. Bernard’s telling of the highly disputed incident in the Bedouin village of Umm al-Hiran is highly misleading, omitting the fact an Israeli police officer was killed in that same incident after being struck by the “local teacher’s” car in what police say was an intentional attack. But, also note the second paragraph’s rhetorical sleight of hand in leading readers to believe that the incident took place in a “settlement”. However, Umm al-Hiran is within Israel’s 1949 boundaries, and is not a settlement. The Israeli Ministry of Strategic Affairs has set up a special “task force” to combat BDS activities around the world, its emissary caught on camera calling for a “take down” of UK MPs critical of Israel. The Israeli in question is Shai Masot, who was the subject of a highly dubious Al Jazeera investigation last month into the Israel lobby’s alleged ‘penetration’ of the UK. Masot was caught on film in a dinner conversation boasting that he’d love to take down Sir Alan Duncan, MP. However, Barnard’s claim that Masot, a low-level employee of the Israeli embassy, was an “emissary” of the Israeli Ministry of Strategic Affairs was contradicted in a tweet by the minister himself, Gilad Erdan. 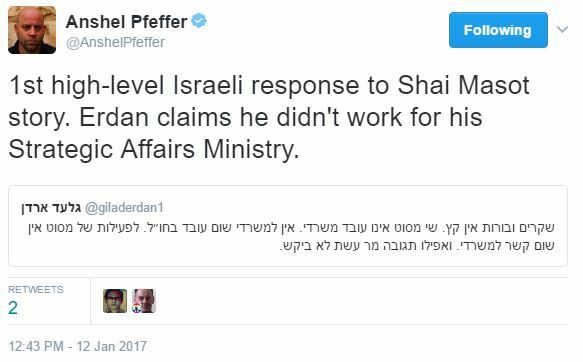 Here’s Haaretz’s Anshel Pfeffer tweeting about Erdan’s flat-out denial of the claim. Indeed, Erdan’s tweet went further than the way it was characterised by Pfeffer, in stating that his ministry has absolutely no employees abroad. The author of the op-ed may feel that Theresa May is showing “contempt” for Palestinian rights by hosting Netanyahu, but it seems to us that Indy shows contempt for their readers by continuing to publish op-eds critical of Israel that play so fast and loose with the truth. How about “Palestinian” Bedouin another misnomer – they are Israeli citizens and have nothing to do with the fairyland called “Palestine”.